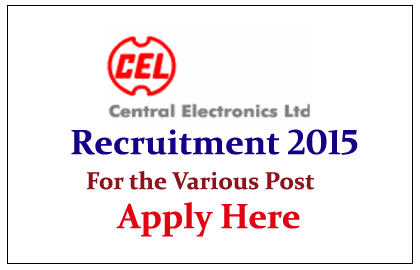 Central Electronics Limited Hiring Candidates the Various Posts for the year of 2015.Eligible candidate can apply for the posts, for more details check below. Central Electronics Limited is a Public Sector Enterprise under Ministry of Science & Technology and is engaged in manufacturing of Solar Photovoltaic Cells, Module & Systems, Railway Signaling Systems and Microwave Electronics Systems etc. Central Electronics Limited, Sahibabad, Distt. Eligible Candidates can send their application form Before 11/05/2015.